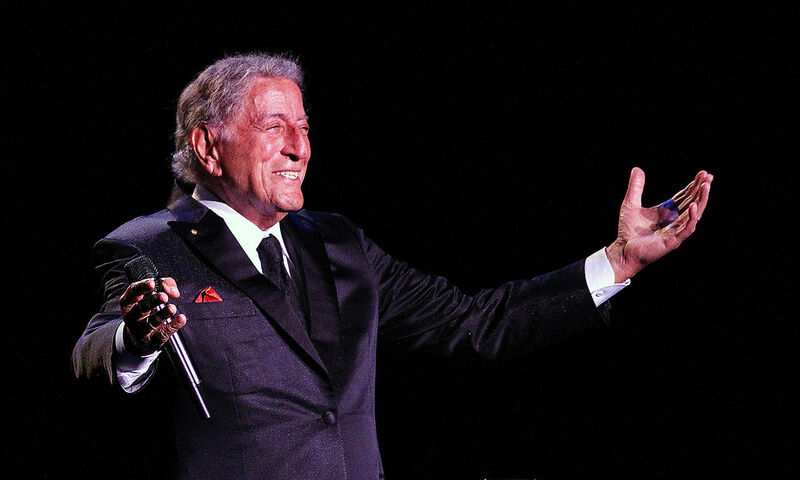 On Friday, October 6, Tony Bennett performed at his hometown’s most prestigious performing venue: Radio City Music Hall. The sold-out crowd was filled with generations of fans that included baby boomers, Generation X, millennials and several representatives from the digital generation. The Tony Bennett Quartet set the mood of the evening. The Quartet’s line-up consisted of pianist and Mr. Bennett’s musical director, Billy Stritch, veteran guitarist Gary Sargent, bassist Marshall Wood, and luminary drummer Harold Jones. The Tony Bennett Quartet did brief musical improvisations as the audience continued to shuffle into the legendary auditorium. Next, the Tony Bennett Quartet were joined by the lovely and talented Ms. Antonia Bennett. Just like her father, Ms. Bennett was a fantastic storyteller, and her vocals engaged the audience throughout her brief set. Her velvet and knockout vocals beautifully filled Radio City Music Hall as she delivered her interpretations of standards such as “Teach Me Tonight” and Brenda Lee’s “Always on My Mind.” She ended her set with Billie Holiday’s “You’re A Lucky Guy,” a song that she dedicated to her iconic father. Mr. Bennett also sang some of his most recognizable tunes from his storied career. The songs included “Boulevard of Broken Dreams,” which was the very first song that he ever sang and “The Way You Look Tonight,” a track that Tony Bennett first recorded in 1961. He also transformed “Rags to Riches” and “Who Can I Turn To (When Nobody Needs Me)” into a medley. One part of the concert that I truly enjoyed was every time that one of the Tony Bennett Quartet members had a solo, Mr. Bennett would walk out next to that band member so that the audience could pay attention to the soloist. A lot of artists (including from my generation) should acknowledge the musicians that perform with them including giving me some solos or recognition. Mr. Bennett also still has his gift and perfectly showcased that he could still hit those high elongated notes. He perfectly demonstrated that ability during the decrescendo of “How Do You Keep the Music Playing?” Also, he also mentioned that he wanted to return to the recording studio and record “The Good Life” with frequent collaborator and friend Lady Gaga. “Isn’t she lovely?” Tony gushed to the audience. He ended his set with standards: “For Once in My Life,” “I Left My Heart in San Francisco,” the somber “Smile,” and the late Louis Armstrong’s “When You’re Smiling.” Before Tony Bennett walked off the Radio City Music Hall stage, he sang a cappella and without a microphone how much he loved the Radio City Music Hall and how much he appreciated them.